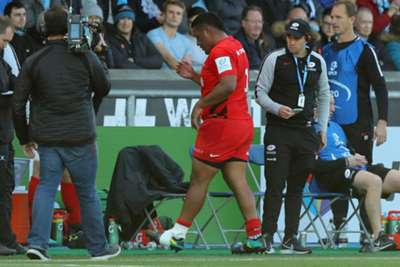 England will be without another key figure for their November internationals after Saracens confirmed Mako Vunipola will be out for six weeks. The 27-year-old prop, capped 51 times by England, suffered a calf strain in his club's European Champions Cup loss to Glasgow Warriors on Sunday and Sarries confirmed he will be sidelined for "around six weeks". Lock Nick Isiekwe, another who England coach Eddie Jones may have called on next month, is also out for eight weeks. Jones' side have four November games at Twickenham against South Africa, New Zealand, Japan and Australia but England have been hit by a spate of long-term injuries. Billy Vunipola, Mako's brother, is out due to a fractured arm suffered in the same game his younger sibling sustained his problem. Former England skipper Chris Robshaw, Joe Launchbury, Sam Simmonds, Ellis Genge and Marland Yarde are all recovering from knee injuries too.